Tesla Stock Price's Huge Potential Reinforced by New "Unlimited Warranty"
Subject: Tesla Stock Price's Huge Potential Reinforced by New "Unlimited Warranty"
5 + seven = Required Please enter the correct value. 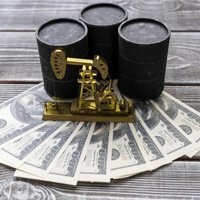 The Tesla stock price has remained volatile all week, reaching a high of $267.26 on Monday before dipping to a weekly low of $251.62 on Tuesday. Today, Tesla Motors Inc. (Nasdaq: TSLA) stock was back in the middle of that range, at a high of $258.80. 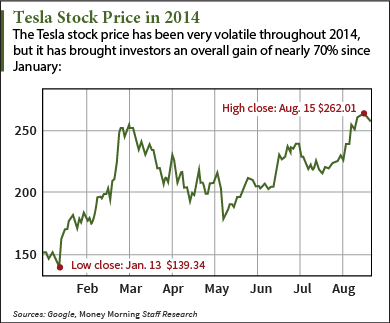 For those who have followed TSLA stock in 2014, that volatility is hardly earth-shattering. Even the slightest bit of news has been enough to move the stock drastically. Last Friday, Musk announced that Tesla will begin offering lifetime mileage warranties on the drive units of its Model S sedans. Tesla already has an unlimited mileage and eight-year warranty on its vehicles' battery packs, and has now extended that warranty to the drive unit. "[T]he warranty extension will apply retroactively to all Model S vehicles ever produced," Musk said on the company's blog. "In hindsight, this should have been our policy from the beginning of the Model S program. If we truly believe that electric motors are fundamentally more reliable than gasoline engines, with far fewer moving parts and no oily residue or combustion byproducts to gum up the works, then our warranty policy should reflect that." While the improved warranty is a huge benefit for Model S owners, Musk admitted that the new policy could impact Tesla's earnings in the short term. But for Musk, the long-term vision of the company and the electric vehicle (EV) market remains the top priority. "However, by doing the right thing for Tesla vehicle owners at this early stage of our company, I am confident that it will work out well in the long term," Musk said. The day of the announcement, TSLA stock had its highest closing price of 2014, at $262.01.